Happy one year anniversary to Empire! Empire! 's You Will Eventually Be Forgotten! 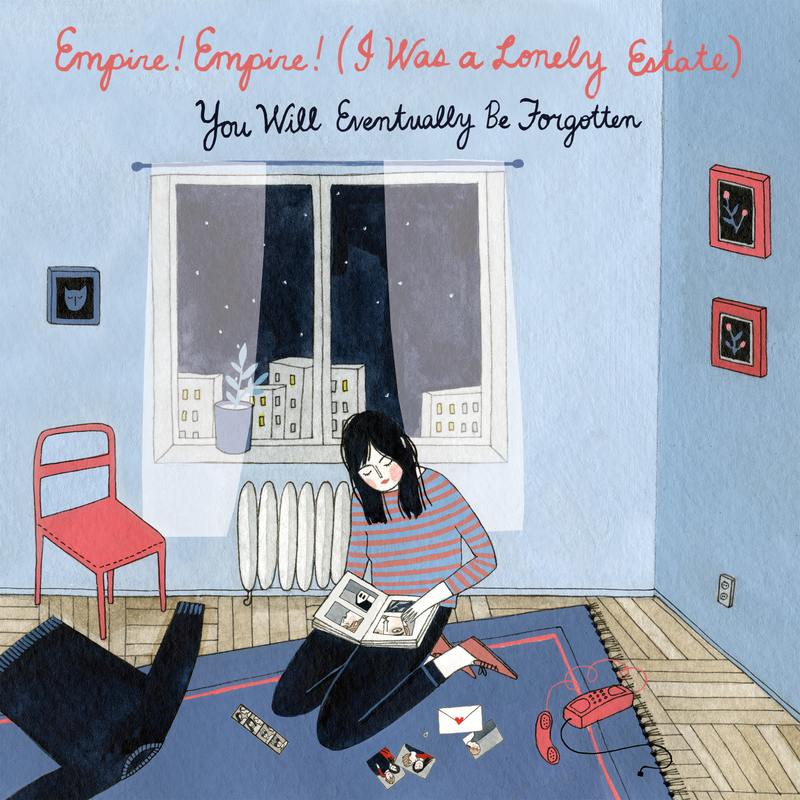 Today is the one year anniversary of empire! empire! (i was a lonely estate)'s "You Will Eventually Be Forgotten". To celebrate, we are having a one day sale only, alongside our friends Topshelf Records. Get the LP for just $10 or the CD for $5, get the (paperback) version of Ribbon for just $5. This is also the last day of our new website sale, so use the code ABOUTTIME until midnight to get 15% off any non-sale, non-preorder item. Which is pretty much everything! Go get it, but don't wait! All the sales end today. Stream a new track from the Dowsing "Still Don't Care" cassette tape at Half Cloth! Pre-order it in our store! Dowsing is back with their second discography tape. The second volume "Still Don't Care" features acoustic songs, demos, rarities, and outtakes from their latest LP, "I Don't Even Care Anymore". The cassette spans a mighty 27 tracks, with plenty of cool and different versions that eventually ended up on their sophomore LP. The official cassette release date is 9/18. Then come straight back here to pre-order the sucker. Or just order it first, then listen. C'mon, you know it's good! 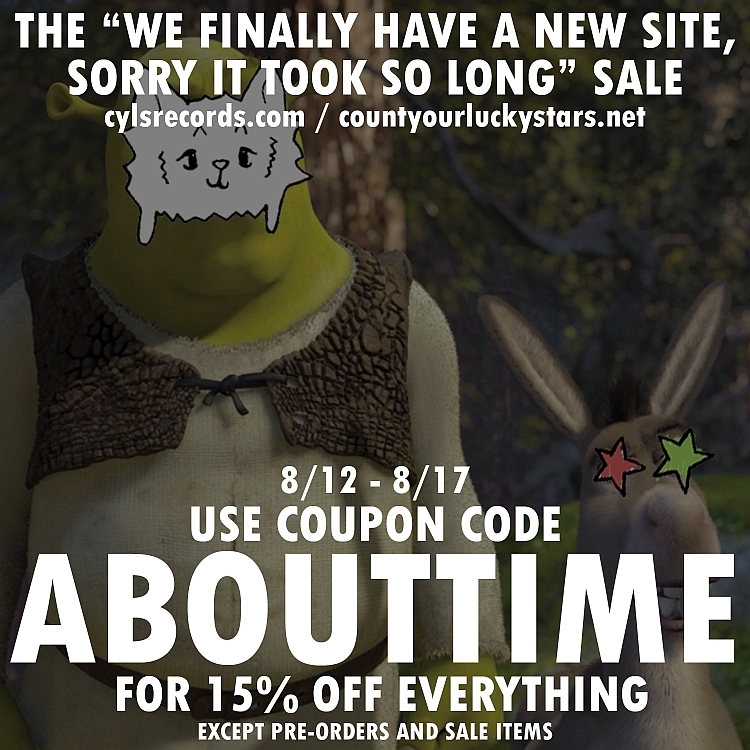 Grab some other CYLS goods at 15% off with the code "ABOUTTIME" while you are at it. Welcome to the brand new Count Your Lucky Stars website! Let's celebrate with a sale! It's here! It's finally here! We have a new website! We've been building this sucker for a long, long time, and we are so proud to finally present it to you. It's clean, it's sparkly, it's everything you want and need to know about CYLS. You can check out our entire roster- from current, alumni, and affiliated, complete with pictures, bios, and links to all their social networking sites. You can see every release we've ever done, complete with pressing info, track listing (both digital and vinyl), and links to all the places you can buy, download, and stream them. We even have a page with all of the out-of-print releases! That's not all! You can listen to nearly every song from the product page in the store. You can purchase the digital download of nearly every release, even if the physical is long gone. You want to see our bands live? All of our current roster are listed on our "Tour" section, so you can see when they are coming to your town. You can watch your favorite CYLS music video, or if you are feeling saucy, you can watch them ALL AT ONCE! We've also got a new mailing list, so if want to get in on the news and exclusive sales, sign up now. We've moved over a portion of our old mailing list, but try and sign up for the new one regardless if you were on the old one. It' s at the footer of the page, so keep scrolling after you finish reading this. Think we're finished? Heck no! You can now access this page via countyourluckystars.net as well as the classic cylsrecords.com. It feels good typing the new one, give it a whirl. We are so excited to finally be able to share this with you. Welcome to a new era, welcome to a new CYLS. As for the sale, we are giving everybody 15% off! Just enter "ABOUTTIME" at check-out. Bask in the glory that is our new website and by great records at the same time! We want to extend the warmest of thanks to Zack Parr, who is chiefly responsible for making this webpage fantastic and functional. He poured countless hours into this and it shows. He runs a record label with his girlfriend called Have Fun Records, and we'd really appreciate you taking a minute and heading over to their website to check out the great releases they have put out. Havefunrecords.org. In fact, they are having the same sale right now- same code. The other goofy label logo on the ad is the Have Fun cat. Thanks, Zack!